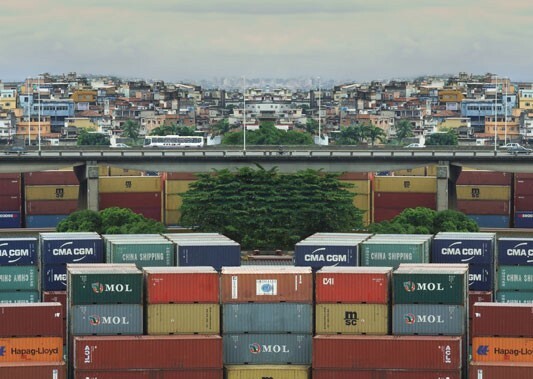 Bulk is a body of video, photography and sculptural work resulting from the artist’s investigation into the logistics of consumerism and capitalism. During April and May 2010, the artist embarked on a 24 day transatlantic voyage on a freighter ship from Buenos Aires to London. Stopping at six different commercial ports in Latin America, Africa and Europe, she observed with great detail the routine processes and bulk operations that define modern industry and commodity culture today. In a time of economic uncertainty, the cyclical process of cargo shipping is still a constant. Steel containers provide anonymity and conceal the items inside. Identical containers pack the docks and vessels with goods that are constantly hidden from view. Bulk explores the homogenized, anonymous steel domain that is the working port and invokes the idea of the double to portray the sense of overwhelming and sublime that one is met with when a system of commodity culture is revealed. Niamh Heery b. 1983 is a multimedia artist from Dublin, Ireland. She graduated from IT Tallaght in 2004 with a Higher Diploma in Audio Visual Media. In the following years she went on to work in the area of contemporary music and media production and had films screened at festivals around Europe. In 2009 she graduated with a BA in Visual Arts Practice at IADT, Dun Laoghaire, specializing in multimedia installation. She spent the following year completing work in Toronto and Buenos Aires. Niamh is currently enrolled as an MA student in the Huston School of Film, NUI Galway. Her work has been exhibited in Ireland, France, Canada and the USA.